1. How many Dalmatians do George and Jane end up with at the end of One Hundred And One Dalmatians? 2. “Grease is the word” is the poster tagline for which film? 3. Which animation studio released Monsters Inc in 2001? 4. What is the title of the sequel to The Lord Of The Rings: The Two Towers? 6. What is the title of the Jon Turtletaub film about Nicolas Cage stealing the declaration of independence? 7. Who played the role of Uncle Fester in The Addams Family and The Addams Family Values? 8. How many Scary Movie films have been released to date? 9. Who played the lead role in Enter The Dragon? 10. The following is a quote from which film, “Nobody puts Baby in the corner”? 1. Which Bond film followed From Russia With Love? Goldfinger? Thunderball? Dr No? 2. Who directed 2008’s Australia? John Hillcoat? Baz Luhrmann? George Miller? 3. Munich was released in which year? 2002? 2005? 2007? 4. What type of animal is Marty, the character voiced by Chris Rock, in Madagascar? Lion? Giraffe? Zebra? 5. Who plays the lead role in the martial arts series Once Upon A Time In China? Jackie Chan? Jet Li? Donnie Yen? 6. This Is England is set in which year? 1983? 1986? 1990? 7. Who directed 1984’s A Passage To India? David Lean? John Boorman? Richard Attenborough? 8. The following quote is from which film, “I’ve been on my own since I was 18. I never really fit in, even in the army”? Captain America: The First Avenger? Captain America: Winter Soldier? Captain America: Civil War? 9. How many clones of Hitler are made and adopted in The Boys From Brazil? 64? 94? 124? 10. 2016’s Train To Busan was South Korea’s first mainstream release to feature zombies. True or False? 2. Dante is the name of the dog in which Pixar film? 3. Mark Ruffalo, Channing Tatum and Steve Carrell appeared together in which film? 4. Which of the five DCEU films is the lowest grossing to date? 5. What is the title of the film in which Viggo Mortensen played Sigmund Freud and Michael Fassbender played Carl Jung? 6. The Castle Of Cagliostro was released in which year? 7. What is the name of the cinematic universe made up of the Harry Potter and Fantastic Beasts films? 8. The following is a quote from which film, “Yes, they do let women do some things at NASA, Mr Johnson, and it’s not because we wear skirts, it’s because we wear glasses. Have a good day”? 9. In Colossal, Gloria manifests as a kaiju in South Korea, when she walks through which area of town? 10. Which film featured Ben Stiller, Tim Robbins, Jack Black, John C Reilly, and Colin Hanks? 1. How many of the 8 Nightmare On Elm Street films did Wes Craven direct? 1? 2? 3? 2. Doc’s dance with Clara in Back To The Future Part III is a cover of a song by which band? ZZ Top? Aerosmith? Lynyrd Skynyrd? 3. The following quote is from which film, “You may dispense with the pleasantries commander, I am here to put you back on schedule”? Master And Commander: The Far Side Of The World? The Right Stuff? Return Of The Jedi? 4. Apocalypto is set in which contemporary country? Mexico? El Salvador? Belize? 5. Which of the following films did not feature Kevin Bacon? Planes, Trains and Automobiles? Frost/Nixon? Flatliners (2017)? 6. Which of the following did not appear in Bone Tomahawk? David Arquette? Matthew Fox? Vince Vaughn? 7. Bad Lieutenant was released in which year? 1979? 1986? 1992? 8. The Big Sick is set in which US city? Chicago? San Francisco? Atlanta? 10. In addition to Bollywood, India has many nicknames for different sections of its film industry such as Tollywood, Lollywood, Dhallywood and Kariwood. True or False? After two prologues we cut to the late seventies and are introduced to Ron Stollworth [Washington], the first black police officer assigned to a quiet mountain town in Colorado. After going undercover at a university rally where a civil rights leader is speaking, Stollworth befriends Patrice Dumas [Harrier]. Impressed with his work, his superiors promote Stollworth to intelligence. There he begins an investigation into the local Ku Klux Klan by calling up and posing as a white supremacist. The department gives the go ahead to continue the investigation but assigns Detective Flip Zimmerman [Driver] to be Ron’s white counterpart for face-to-face meetings. Both men manage to form a symbiotic performance that fools the affable head of the Klan chapter, Walter [Eggold] but the hot-headed Felix [Pääkkönen] has doubts. Over time, Ron and Flip impress the Grand Wizard of the Klan, David Duke [Grace] to the extent that he makes a personal visit to Colorado for “Ron’s” official initiation. A lot of care and attention has been taken on a technical level that produces a rich period environment. The hair, make-up, costumes, sets, props, music choices, everything feels genuine and appropriate to the late 70s. More than that, shooting on 35mm film-stock rather than digital gives a really evocative and immersive feeling. What’s interesting on top of that is not necessarily the curbing but the subtle integration of Lee’s tropes and distinct style to create a very mainstream production with grounded cinematography, direction and editing. The music is another fine example of this with marvellous choices of songs paired with Terence Blanchard’s cool yet unsettling score; perfectly mirroring the tone of the on-screen exploits. While films about undercover cops is nothing new, the similarities make it all the more trenchant and necessary. At the same time, the performances all round are honestly magnificent. On the one hand we have the cops – who are in of themselves a conflicted group, stuck in the past while progressive elements are trying to drag them forward – and on the other is the klansman with their repugnant views packaged with charm and repurposed as a political movement rather than a hate group. Flitting back and forth between these environments is the cause of a great deal of humour (racism makes for natural comedy.. because it’s so very fundamentally stupid) and there are some standout moments of hilarity on both sides but after all the bloviating and mockery subside, all you are left with is a group of hateful and dangerous individuals. There’s a brilliant cross-cutting between “Ron’s” initiation wherein they are watching and cheering the KKK in Griffith’s silent film The Birth Of A Nation and a group of students listening to a testimonial of a man who witnessed a violent street execution of a black man, partly inspired by the events in said film and all the while you are captivated by the stellar performances. One that comes to mind, in a disturbing way, is Driver’s double-performance. This is both a testament to him as an actor (one of the few I genuinely look forward to seeing in anything right now) and how dangerously easy it seems to switch between outwardly reasonable and polite to saying the most horrific and deplorable things as if they were always there beneath the surface. Driver’s character, Flip, should struggle undercover, he shouldn’t know how to react in these situations but it comes all too naturally, not because he is racist but because he is surrounded by simmering and secluded racism. Because of the subject matter, it is very difficult to avoid discussing the motivation behind this film’s creation. More than simply telling an anecdotal story of one police investigation, it is a look at the nationalist resurgence crippling western civilisation right now. Sure, this is a tense, funny, clever, poignant release in its own right but it is also actively hoping to start a conversation and motivate people to vote and better collective values. This isn’t anything new for Spike Lee and is largely present in pretty much all of his works. More than that, during a post screening Q&A, Lee said that every artist creates political work, and that choosing not to include politics is in of itself a political statement. The responsibility and duty of the artist to create something entertaining that says something, no matter how simple and too much lenience in the interest of balance has been given to groups that are given global platforms to preach hate. Which ultimately makes for an interesting on-screen balance because the worst thing to do would be to pose the klansman as some cackling, moustache-twirling villain of the past, rather than the very real, active and thriving movement that they currently are. 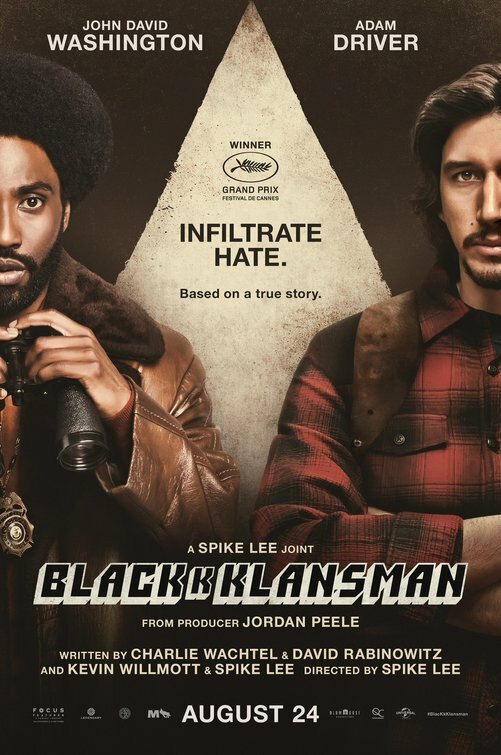 The biggest flaw I can find is that BlacKkKlansman lacks subtlety. But in truth the surreptitious and insidious creeping nature of intolerance needs a bit of bluntness to get through to audiences, so I can’t slate it too heavily for that. I could also bash the fact that certain elements have been heightened for cinematic purposes but these liberties are always taken with anything based on real-life events, so again, it’s hard to take the film too much to task for that. Much like the 1970s, I feel this contemporary period of social and political change will be the subject of filmmaking for decades to come and the cyclical nature of movements paired with the idea that progressive battles are never won outright, they must constantly be fought and refought to keep fascism at bay, is as interesting at it is tragic. And for cleverly reflecting the societal divide that has split several nations in these recent years, this film deserves as much attention and praise that it can get. Audience members familiar with Spike Lee and his work, will be more than familiar with his patented double-dolly. Obviously he didn’t invent the technique but it’s something fans come to expect from the director and its placement is excellent. The narrative closes on a few upbeat notes before utilising this shot to not only bring the tone to a darker place but to bring us hurtling into 2017. Suddenly all the laughs and victories are set aside and the fiction of it all is brought into stark realisation with the footage of the murder at Charlottesville, President Trump refusing to denounce Nazis and Duke promoting Trump’s agenda of “taking America back.” Ending with an upside down American flag that becomes a desaturated monochrome symbol is, as stated earlier, very blunt but that’s to ensure the point is made clearly. As unfortunate and irritating as nepotism can be, sometimes talent just runs in people’s veins and Washington is a fine example of the latter. I only discovered he is Denzel Washington’s son when writing this review but his talents are genuinely impressive and I am looking forward to him being cast in.. well.. frankly everything. Charming, confident, driven, vulnerable, conflicted; Washington gives a wonderful performance that is one of the key reasons this films works so spectacularly. 3. Who played the title role in Pretty Woman? 4. The colony in A Bug’s Life is made up of what type of insect? 6. What is the name of Vin Diesel’s character in The Fast And The Furious? 7. Alex Winter and Keanu Reeves first starred together in which film? 8. The following quote is from which film, “This is Natalya. She is my sister. She is number four prostitute in all of Kazakhstan”? 9. Who composed the respective scores for Spider-Man, Batman, Avengers: Age Of Ultron and Justice League? 10. Titanic is set in which decade? 1. Who directed Prisoners? Duncan Jones? Denis Villeneuve? Sam Menses? 2.The Silence Of The Lambs was released in which year? 1989? 1991? 1993? 3. Gone Baby Gone is set in which US city? New York? Baltimore? Boston? 5. How many years passed between the Swedish and American releases of The Girl With The Dragon Tattoo? 2? 4? 7? 6. 2006’s Silent Hill is an adaptation of the video game of the same name that was released exclusively on which console? PlayStation? XBox? Dreamcast? 7. Who played the British academic scientist in 1998’s Phantoms, alongside Rose McGowan and Ben Affleck? Patrick Stewart? Peter O’Toole? Richard Harris? 8. What is the title of the 1938 Alfred Hitchcock film about a young lady looking for her missing travelling companion on a train? The Lady Vanishes? The Empty Seat? Ticket For One? 9. What is the name given to the quarantined zone in Alex Garland’s Annihilation? The Shimmer? Alpha Site? The Barrier? 10. Ron Howard was fired from 2003’s The Missing but as most of the film was shot and the new director was more difficult to work with, Howard was re-hired. True or False? 1. What did Stanley Kubrick direct in between The Shining and Eyes Wide Shut? 2. What is the prince’s name in Beauty And The Beast? 3. Who directed the 1995 remake of Village Of The Damned? 4. How many films have Russell Crowe and Leonardo Di Caprio appeared in together? 5. What two words are written on the pupil’s eyelids in Raiders Of The Lost Ark? 6. Aladdin was released in 1992 in America. What year was it released in the UK? 7. Al Pacino played the role of Carlito Brigante in which film? 8. The following quote is from which film, “You could learn from this guy, Gaff. He’s a goddamn one man slaughterhouse”? 9. What is Jean Val-Jean’s serial number in Les Miserables? 1. How many presents does Dudley receive in Harry Potter And The Philosopher’s Stone? 22? 36? 48? 2. In which film did Robin Williams play English teacher John Keating? Seize The Day? Dead Again? Dead Poet’s Society? 3. What is the title of the 2013 Boston marathon bombing film starring Mark Wahlberg? Lone Survivor? Patriot’s Day? Mile 22? 4. Who voices the role of the Wolf Man in Hotel Transylvania? Steve Buscemi? David Spade? Kevin James? 5. Who directed Stand By Me? Rob Reiner? Tobe Hooper? Frank Darabont? 6. Which of the following is not a Godzilla film? Monster Invasion From Below? Godzilla Raids Again? Destroy All Monsters? 7. Robocop was released in which year? 1984? 1987? 1989? 8. Which of the following did not appear in Ridley Scott’s Exodus: Gods And Kings? John Turturro? Jeff Goldblum? Sigourney Weaver? 9. Which infinity stone was housed in Loki’s sceptre in The Avengers? Mind? Space? Time? 10. Steven Spielberg never records director’s commentaries for DVD or Blu-Ray. True or False? Following the events in Captain America: Civil War, Scott Lang [Rudd] is nearing the end of his two year house arrest. In that time he has had no contact with Dr Hank Pym [Douglas] or his daughter Hope Van Dyne [Lilly] but when relaxing in the bath, a mere two days away from freedom, Scott has a vision of Hope’s supposedly deceased mother, Janet Van Dyne [Michelle Pfeiffer]. Freaked out, Scott contacts Dr Pym and we learn that this dream was no coincidence as Hope and Hank had been working on a quantum tunnel in an attempt to locate and retrieve Janet. But as wanted criminals, the scientists have been working with the nefarious Sonny Burch [Walton Goggins] and have got the attention of a mysterious quantum-shifting figure, known only as the ghost [John-Kamen]. When Ant-Man was released I was thoroughly disappointed. Avengers: Age Of Ultron had been a bit of a bust and the turbulent behind-the-scenes shift of directors left a strange chimera film with trails and remnants of Edgar Wright’s tropes and Reed’s direction. The final product was serviceable but I didn’t share the lauding that most critics and audiences were spouting. Subsequently, I was rather looking forward to an Ant-Man sequel, a chance to create something from the ground-up with a clear voice and, hopefully, a strong central female performance. Alas I only got one of those. One of the biggest problems this film encounters is the generally piss-poor, infantile, simplistic and flat comedy. From throw-away lines or setups to running magic jokes, nothing landed hard enough for me to laugh at and wholly enjoy. That isn’t to say it wasn’t entirely without humour, it simply failed to produce anything that I hadn’t seen before. On top of that there was a distinct lack of emotional resonance. 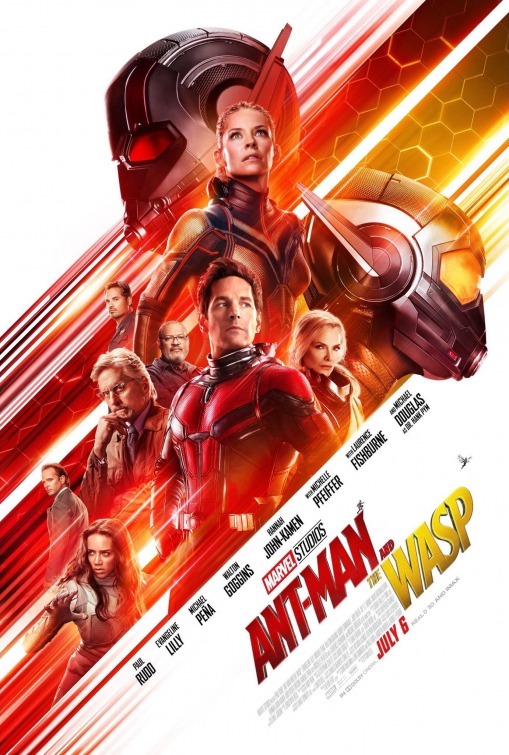 Over the last decade, Marvel have wheeled out some pretty hefty emotional moments and connections between characters and while Ant-Man And The Wasp has the opportunity to, it rarely delivers. I will admit that the connection between Rudd and his daughter and the purveying theme of daughters and their screw-up dads is interesting but it’s nowhere near as gut-wrenching as something like the connection between Stark and Parker. Sticking with performances for a second, I will absolutely defend everyone involved. Rudd tries his hardest and Lilly is wonderful but the script is so painfully cliché with abysmal dialogue, leading to stunted deliveries. From the completely mediocre jokes to the text-book “I thought I’d lost you” sentiments, nothing in this film feels fresh, realistic or relatable and while that may sound a bit harsh or stupid, you need some sort of grounding when the entire basis of the story is the fantastical. This film also drags Marvel back into the pit of questionable villains – which is a shame after the marvellous complexity of the last two. Ava Starr/Ghost is a decent enough sympathetic villain, even if she is never really fleshed out but Sonny is terrible and continues the weird trend of Goggins being fantastic on TV but getting terrible roles on film. And then there’s Woo (played by the genuinely funny Police Academy film. Getting back to Ava for a second, the character highlights some of the film’s technical issues. While the ghost effect looked pleasing and felt like a simple layering technique harking back to silent movie techniques, the action was largely uninspired. Say what you will about the first Ant-Man film, at least it was creative. Here we have fights that suffer from rushed, fast-paced editing (which somehow seemed to be cut better in the trailer), far too many ropey floating-head CGI moments and shrinking/enlarging tech that fails to create anything of note. I mean, when a 2018 blockbuster is giving you flashbacks to 2003’s The Matrix Reloaded but never rising above it, something has to be going wrong. Having said all that, Christophe Beck’s score is magnificent, making great and sometimes playful use of the motif (something Marvel struggles with) while delivering something constantly fitting and appropriate. Additionally, the de-aging effects are remarkable, Marvel have been doing a stellar job with this innovative technology.. although I wasn’t as convinced by the de-aged Hope. That was a joke. Sorry. It was either that or a DC facial hair removal gag. As with 2015’s Ant-Man, it came off the back of the high-stakes, ultra-scale Age Of Ultron and with its standalone, unique story, endeared a lot of people to it. Then Lang reappeared in Civil War and the character was cemented as a great asset to have others interact with, offering some fantastic levity and visuals. This sequel should have built on that momentum, giving audiences an opportunity for a light emotional lift after the dour close of Avengers: Infinity War. But it wasn’t. Missing is the outlandish comedic treatment of Thor: Ragnarok and the character/world building of Black Panther, in favour of some weirdly delivered dad jokes, call-backs and importance placed upon the quantum realm that still feels like a complete mystery. In truth, this whole corner of the MCU feels like an arc on Spider-Man: Homecoming – and that was amusing but this is ridiculous. All we see is an enlarged ant playing the drums in Scott’s absence – the scene takes place in the trailer! At this stage we have to ask, what’s the point? I know Marvel are expected to generate two sequences but that was an absolutely pointless piss-take and to have already shown it in not only the theatrical trailer but earlier in the film from a different angle emphasises its absurdity. So I haven’t mentioned Michelle Pfeiffer, despite the fact she appears on the poster. On one hand, I really enjoyed Pfeiffer’s performance and on the other, it generated so many logistical questions that go completely unanswered. After Dr Pym enters the quantum realm, he discovers his not-dead wife and brings her back. She has been living down there for thirty years. Somehow. A single line of dialogue about the curative powers of the realm itself leading to a sort of evolution is all we get to explain how she has survived in this mostly barren plane of existence.. with perfect make-up. But to dissolve the tension between our heroes and the adversarial Ghost character, is to stretch out her hands and say, “I can feel your pain” before curing her. That. Right there. Is Sybok from Star Trek V: The Final Frontier. Nobody understands her frankly magic powers (almost as if the constant magic talk is merely foreshadowing) and I’m sure they’ll be explored later but for a film that spends so much time doing so little, you’d think they would have been able to etch out some time to even loosely cover it.